The first thing you notice upon entering are unicorns. A rubber mask hung from the coat rack. A white unicorn stag head sat between two televisions over the bar. Bottle holders of unicorns on their backs drinking on the bar top. Bright colored inflatables sat on the cases for sale. At Saucony Creek Brewing Co. unicorns are very thirsty. The GPS took us to a former car dealership. There was very little signage; a single poster in a window and some stickers on the door. Too little signage for such a gem. 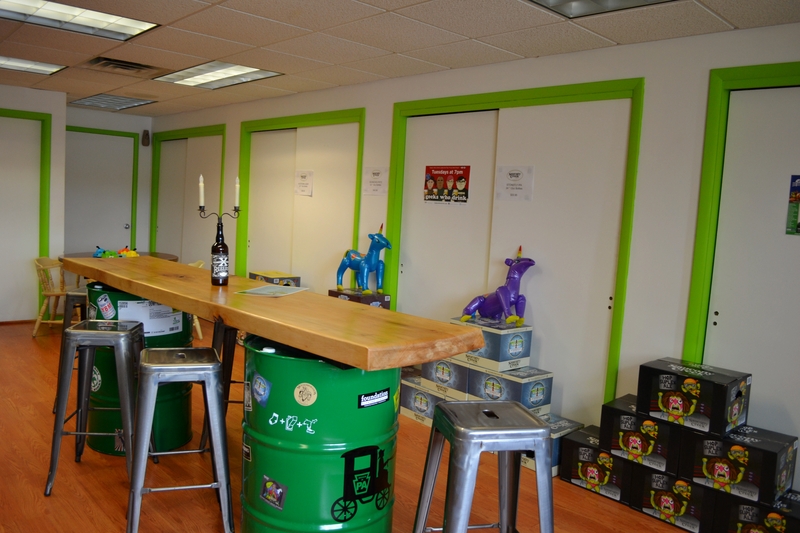 The taproom was all white walls with vibrant green trim which pops. It has an extended bar with a gorgeous wood top. Wood slabs display the company’s logo on the bar front and below the unicorn stag head. There is also extra seating with 750 ml beer bottle candelabras, and one table even has Hungry Hungry Hippos ready to play. Their beers and current draft list can be found here & here. 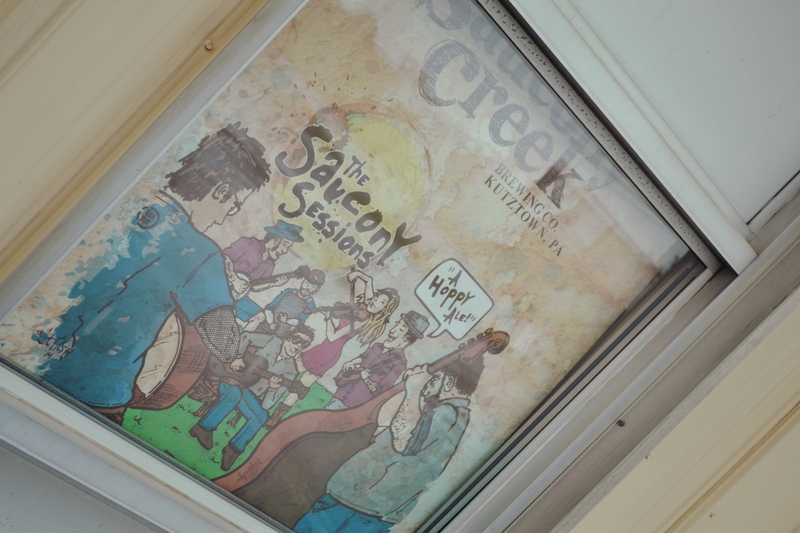 Check out Saucony Creek’s website as they list each beer’s information and “story”. If you go to taste all their fabulous beers, be sure to try their Schnickelfritz Chocolate Cherry Milk Stout, XReserve 05-2015: Ginger Saison, and Roxie’s Golden Bananas! A refreshing wheat beer with a unique Saucony twist. We add real bananas to the mash and ferment this wheat beer at just the right temperature to allow the German Hefeweissen yeast strain work her magic, bringing out a distinct banana aroma and flavor without any artificial flavoring additions. This is an all naturally flavored, unfiltered banana wheat beer. 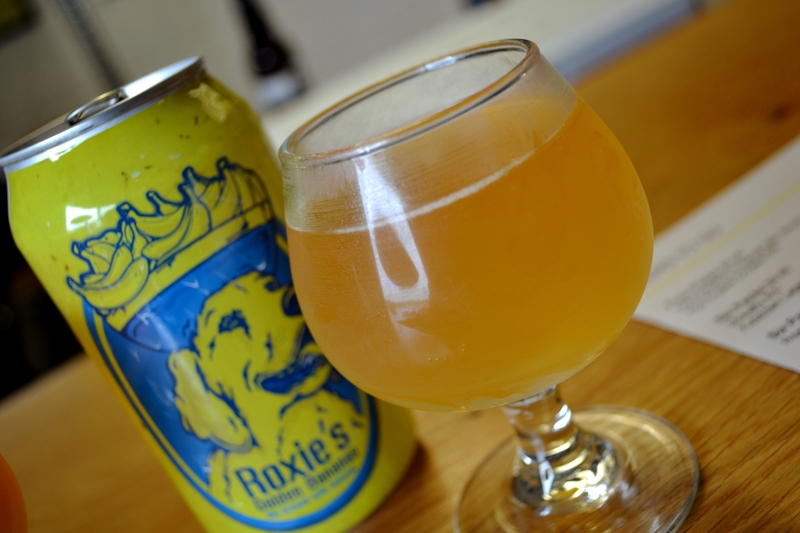 Roxie’s was brewed and named in honor of a brewery friend and companion the late great Golden Retriever, Roxie Werley (SOURCE). The taproom is open today (Sunday) 11:00 am – 8:00 pm. End your weekend on a good note!